CHICAGO -- It might be a little dry, but nobody can say that Chicago Blackhawks captain Jonathan Toews doesn't have a sense of humor. Following Wednesday's 6-4 win against the Calgary Flames, it was suggested to Toews that the top line he centers should probably have a catchy nickname considering how much impact it's had in the Hawks' six-game win streak -- which they'll try to extend on Friday night against the Carolina Hurricanes. "Yeah?" Toews deadpanned. "Well, let's not push it." The response drew laughs, mostly for its impeccable timing, but it was also Toews' way of saying there's still a long way to go before the Hawks can breathe easy in the pressure-packed Western Conference playoff chase. Case in point: Toews and linemate Patrick Sharp both missed Wednesday's morning skate at the United Center and NHL.com learned that Toews was feeling a little ill. Fellow linemate Patrick Kane, however, thinks they'll both play against the Hurricanes. "Everyone should be good," Kane said. "I think both of them were just taking a little bit of rest today in practice, nursing some things. I'm expecting them both to be back tonight and hopefully they are." That's because there is no denying how hot Toews, Sharp and Kane have been ever since the Hawks put them together as the top line on Feb. 9 against the Edmonton Oilers. That was 11 games ago. Since then, Chicago has gone 8-1-2. The Hawks have also vaulted from outside the playoff picture to fourth place in the West before Friday's games. Meanwhile, the top line is averaging four points a game in that stretch. 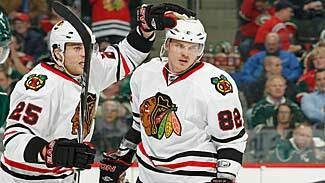 A big reason, Kane said, is the trio's inner-competition to keep scoring. "One of the things about it is, we'll get one or two (points) and we keep saying to each other, 'Never quit,' " Kane said. "We're never satisfied on the bench. Whether it's Johnny saying it, myself or Sharpie, it seems all of us never want to quit. There have been games where we've had two or three (points) and we keep trying to get the fourth one. It's fun hockey to play. Hopefully we can stay hot like this." Chemistry also plays a role. Any of the three are just as apt to score as they are to set up a goal. They also enjoy playing below the goal line and in the corners, where they look to set each other up for scoring chances. "Myself and Johnny, we've had some chemistry for awhile," said Kane, who is in his fourth NHL season. "You put Sharpie on that line and he kind of roams the areas and finds the open holes, whether he's getting pucks or finding open areas to get shots. He's really deadly when he gets open, so we keep trying to feed him the puck." Against the Flames, Sharp found Toews with a precise cross-ice feed for an easy tap-in marker. "We know it's not going to happen every shift," Sharp said. "Sometimes we're going to go games without scoring. But we're three guys who like to think we can skate well and make plays. We're all hungry to score every shift. We know that we have defensive responsibilities and I think that we've been solid in that area, but I like to think we have some chemistry and hopefully there's a lot more down the stretch." Stalberg fight earns rave reviews: After being crosschecked in front of the Calgary goal during the second period on Wednesday night, Hawks forward Viktor Stalberg got into a shoving match before dropping the gloves to fight Flames defenseman Mark Giordano. Stalberg held his own, especially considering it was his first NHL fight. "I guess I could use a couple pointers," he said. "That was my first real fight, I guess. I think (the guys) were pretty pumped up. I don't think they expected it. There's not too many fellow Euros who fight, I guess. But it was just one of those things that kind of happened." Stalberg is one of the more popular Hawks players among female fans because of his looks, and Sharp is probably his only competition in that regard. Sharp was recently named one of Chicago's most beautiful people by Chicago Magazine, and he was asked after the game if he'd hoped Stalberg got a little lingering damage in the scrap. "Yeah, I was a little," Sharp said, laughing. "Maybe a little broken nose or something. Maybe knock a tooth out … because he's got a pretty face." Kane playing 300th game: Wednesday night's game will be the 300th NHL game -- all with Chicago -- for Kane, who will be the second-fastest Blackhawk to reach that milestone. "Is that tonight?" Kane said. "Don't tell anyone in here. That's crazy. It's my fourth season and it seems like just a little while ago that I was coming in as an 18-year old who didn't know if I was going to make the team or not. It's exciting. It's awesome playing hockey in this League and you always want to play as many games as you can." Kane is also excited to play the Toronto Maple Leafs on the road Saturday night, which will be televised on CBC's Hockey Night in Canada broadcast. Growing up in Buffalo, N.Y., Kane's family got CBC broadcasts on TV and he watched a lot of HNIC games. "Whether it's in Vancouver or Toronto or wherever, you know it's Saturday night and Hockey Night in Canada," Kane said. "I'm sure all of us, even myself, as an American, grew up watching those kinds of games. I remember every Saturday night I'd be on the couch watching, whether it was Buffalo against Toronto or the Leafs against someone else. Those are fun games to watch."